What happens if things turn up to site - And they don't fit? Modern construction often involves an element of manufacturing off site then installing them into the building. Often however these elements may need to fit a part of the building which doesn't exist at the time of ordering. This is usually for elements with a long lead time (such as steel and glazing) which, were we to wait for the building to be in place, would delay the project unnecessarily. We therefore like to model this type of element before it gets to site, and then have the manufacturer send us their fabrication model so as we can check it against our before it gets made and sent to site. Coordination of information in this way has given us great confidence when it comes to manufacturing information. We won a proposal to extend, alter and refurbish an existing hotel. Our plans included the demolition of an existing timber framed conservatory along the front of the building and its replacement with a new entrance and glass-fronted link with breakout space and reception accommodation. This new link was to incorporate five different level connections and work with three main level changes across the front of the hotel. The foundations for this building were stepped across the site and the steel frame also needed to accommodate these steps as well as head clearance heights to a tolerance of 20mm when finished. Our appointment incorporated coordination of all information. Given the crucial nature of getting the levels correct across the building, we worked closely with the structural engineer to provide a coordinated set of (modelled) information to the contractor. He provided us with drawings, and we modelled everything. Once the project started on site, our involvement was limited to co-ordination; a project manager was overseeing the build. The coordinated drawings were sent out to tender and a local steel fabricator was appointed. The steel fabricator used CAD-CAM (Tekla…Steel fabricators were the first people we managed to collaborate with in 3D) They therefore prepared a full fabrication model of the proposed steel frame based on the coordinated information including all connection details, bolts, thermal breaks etc, which they sent us to sign off prior to manufacture. The fast track nature of the project however meant that this necessarily had to take place prior to the casting of the foundations and setting of the pad stones. We knew this to be a risk. However, we overlaid their fabrication model on our steel frame model and it fitted perfectly. Minor finish adjustments were made to our architectural model but no major work was required. Coordination was achieved with the Existing Building, the Proposed Extension, the Foundations and the Fabrication model. So we signed off the steel for fabrication subject to the contractor taking responsibility for the rest of the building being constructed as per the information provided. When we received a call from site stating that the steel frame ‘did not fit’. We knew that the frame was correct, the survey was correct, and the information provided for the foundations was correct. What had actually happened was that the ground-working contractor had set out the foundation pad heights incorrectly. A site visit confirmed immediately that this was the case and the problem was remedied via the groundwork contractor, without any blame apportioned to the design architect or supplier. 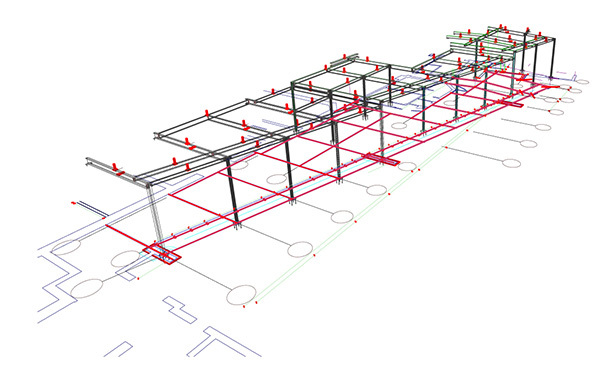 Whilst we always prefer involvement beyond Stage 4, where commissions restrict such involvement, a coordinated BIM approach makes for ‘better’ information, allows construction errors to be easily identified, and reduces risk from the designer’s point of view. Moreover, when the inevitable requests for additional schedules, sections and details arise, they can be easily generated.